The fall and winter months can be hard on your drain system, with debris like dirt and leaves potentially building up and clogging your drain. It is important to plan for maintaining your drain tiles by properly cleaning them every 12 to 18 months. Doing this can lead to significant cost savings down the road, as your plumbing equals an average of 15% of the value of your home. So… your drainage system should be one of the first priorities! Start with a drain camera inspection. Inspecting your sewer and drainage system allows us to see the state of the drain tile and extends the life of your system. It also saves you money by discovering potential problems and fixing them before they occur. 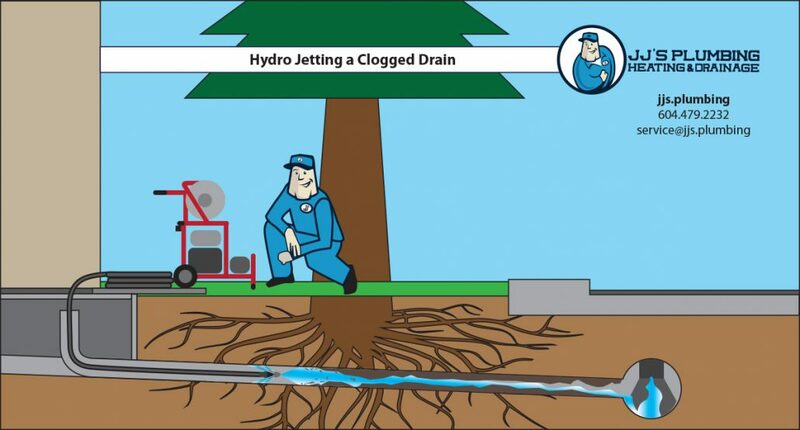 Have your drains cleaned with a Hydro Flushing machine. If the camera inspection shows that your pipes are not fully blocked, a Hydro Flushing machine will be used to restore the drain line back to full health. Use a power auger or cable machine if drains are clogged. If the camera inspection determines that your pipes are blocked, a power auger or cable machine will be used first (i.e. snaking a clogged drain), followed by the Hydro Flushing machine. Keep your home a healthy and safe place, and get in touch with JJ’s Plumbing about drain tile maintenance. Drain cleaning is on special until April 30, 2019. 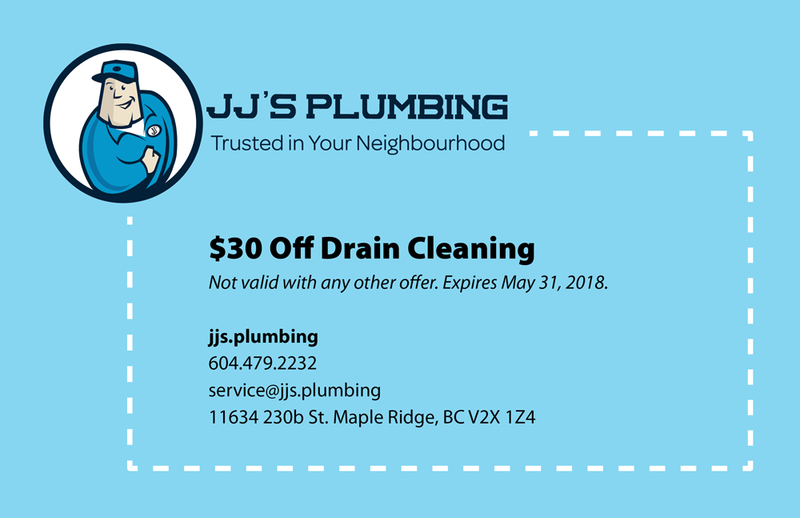 Email us at service@jjs.plumbing, or call us at 604-479-2232 to book today. We’ve definitely started to notice the temperature shift this season (though, it might not quite look like this snowy photo yet)! Before it gets too cold with freezing temperatures, it’s a good idea to take action and prepare your plumbing for the winter months. When water freezes and becomes ice, it expands. This causes pressure within pipes which may lead to significant damage, and therefore, increased and unexpected cost to repair, which could have been avoided. Check out more tips on keeping your drains clear, as well as the signs to look for in regards to frozen pipes: https://jjs.plumbing/winterizing-your-plumbing-system-and-signs-of-frozen-pipes. Do you have any further questions? Find out more at jjs.plumbing, or send us an email at service@jjs.plumbing. You can also call 604-479-2232. It’s just about Spring, which means a season with a mixture of sun and still lots of rain. The good news is, we can expect—and already are—having some warmer weather! Spring is a perfect and important time to prep your home for the summer, including cleaning up your drain tiles. The fall and winter seasons lead to more debris like leaves and dirt potentially clogging your drains. Starting with a drain camera inspection is a great idea. Your plumbing equals an average of 15% of the value of your home, so your drainage system should be one of the first priorities. It prevents small issues that could be forming, from becoming large problems. Inspecting your sewer and drainage system allows us to see the state of the drain tile. It extends the life of your system. It saves you money by knowing about potential problems and fixing them before they occur. It is crucial to maintain your drain tiles by properly cleaning them every 12 to 18 months. If you have had a camera inspection and your plumber has informed you that your drains should be cleaned, there are two ways this can be done. If the camera inspection shows that your pipes are not fully blocked, a Hydro Flushing machine will be used to restore the drain line back to full health. If the inspection shows that your pipes are fully blocked, a power auger or cable machine is used first (i.e. 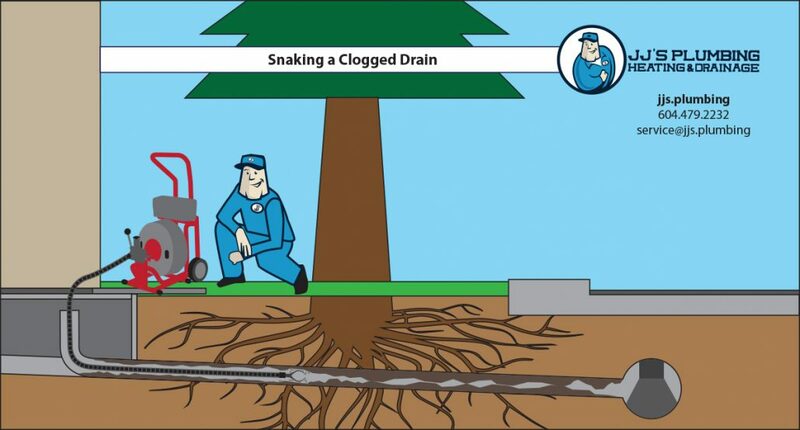 snaking a clogged drain). 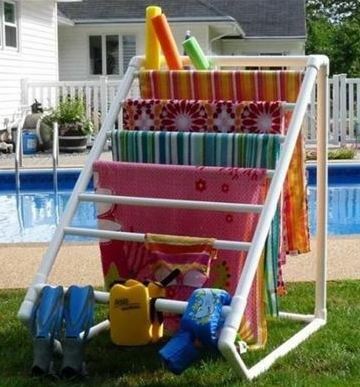 This is followed with the Hydro Flushing machine. So… what are you waiting for this spring? With the theme of Spring Cleaning, it’s the perfect time to take care of your drainage system, and keep your house in a healthy state. Until May 31, drain cleaning is on special for $30 off the service! Contact JJ’s Plumbing for a camera inspection or drain cleaning at 604-479-2232 or email service@jjs.plumbing. 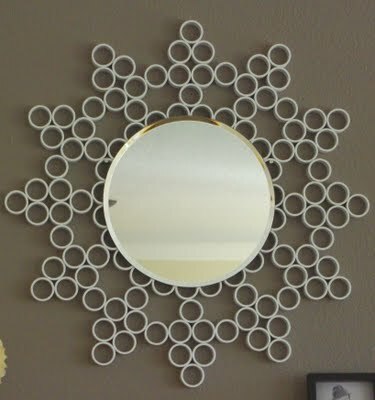 https://jjs.plumbing/wp-content/uploads/2018/03/March-19-Motivational-Monday.jpeg 628 940 Janet Stolth https://jjs.plumbing/wp-content/uploads/2017/12/JJs-Plumbing-logo-with-tag.png Janet Stolth2018-03-18 14:03:462018-03-18 17:27:23It's Time for Spring Cleaning - of your Drains Too! You turn the shower on, wait for it to warm up, get undressed, step into the shower and… you’re stepping in a little puddle of water forming around your drain. Does this sound too familiar? Or how about this one: you turn on the kitchen sink to do the dishes, have not put the plug in the sink, yet the water is already filling up. The worst part is, this happens far too often, and you do not feel like telling your husband that it has happened again. JJ’s Plumbing has got your back lady! We’re here to help by sharing the following 3 easy “do-it-yourself” tips so that you don’t have to have that painful conversation (or at least not as often). The easy, preventative method: baking soda, vinegar and boiling water. Nothing scary or difficult here! Put about ¼ cup of baking soda and ¾ cup of vinegar down your drain. This forms a chemical reaction (not to worry, nothing drastic) that will break up soap scum that has formed and traps food, hair and other substances in your pipes. Boil your water in a kettle or larger pot to allow for about 10-15 minutes for the baking soda and vinegar to do their job. Once boiled, pour the water down the drain. This will help melt any grease build up, and send along its way. Need the visual? No problem, watch this video. Tea-strainers! You can actually use tea strainers to help your drains stay unclogged. Fit all of your tubs and shower drains with strainers to catch the hair (and other substances you don’t want going down your drain). Be sure to clean the strainers regularly. What NOT to put down your garburator, kitchen drain and toilet: coffee grounds, grease, fats & oils, hair, egg shells, and fibrous foods (celery, corn husks, potato peels) are some everyday items/foods that can clog your drain. Also, don’t flush feminine hygiene products down the toilet. Yes, they’ll flush, but instead of disintegrating they can leave you with a clogged toilet and mess you won’t want to deal with. 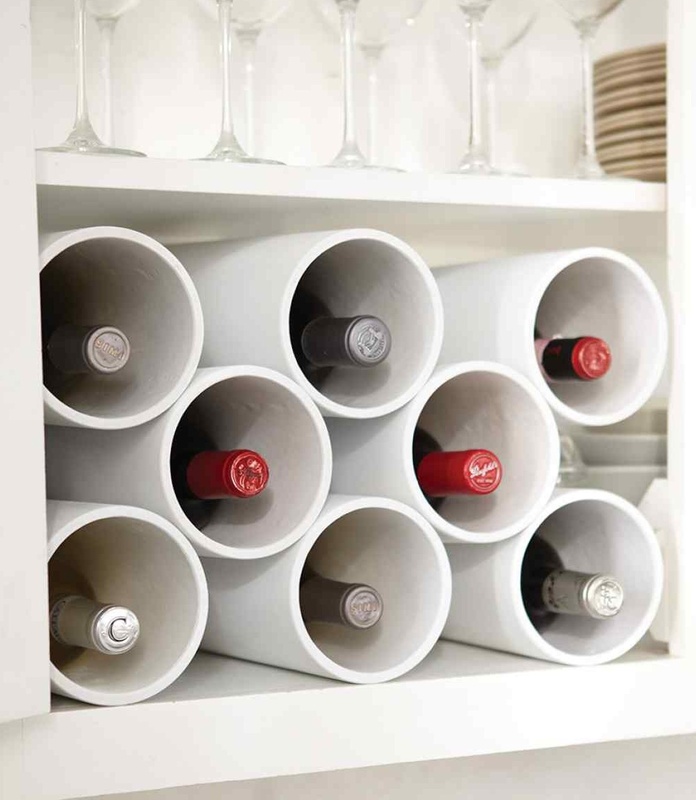 We hope these 3 tips have been helpful to you and will help bring further peace to your home. But of course, feel free to contact us anytime if you have questions or need further assistance with your drains. It’s officially summer! The season is a great time to check in on your home plumbing system, but it is also a time where the rising temperature can lead to an increase of water usage. So let’s break it down in 2 parts: 1) Summer plumbing system check-in, and 2) helpful tips to save water and give your Hydro bill a break! Check all of your appliances and fixtures plumbed into your water system for leakage. 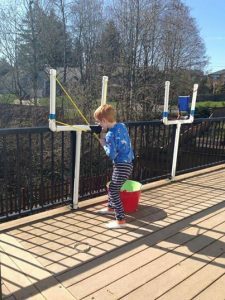 More fun time spent outside means extra dirty clothes (especially if you have children). Check your washing machine hoses for leaks, cracks and bulges. A rubber washing machine hose should be replaced about every 3 years. Check your drain spouts and gutters to ensure that they are clean and free of blockages. Figure out where your water shut off valves are and how to shut off water to your toilets, sinks, and any water using appliances, or how to turn off the water to your whole house. 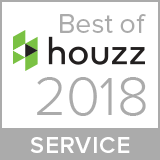 Learn how to take care of small problems yourself – every home owner should have a plumber’s tool kit that consists of a plunger, auger, pipe wrench and sewer snake. Repair any damage or problems you see right away! 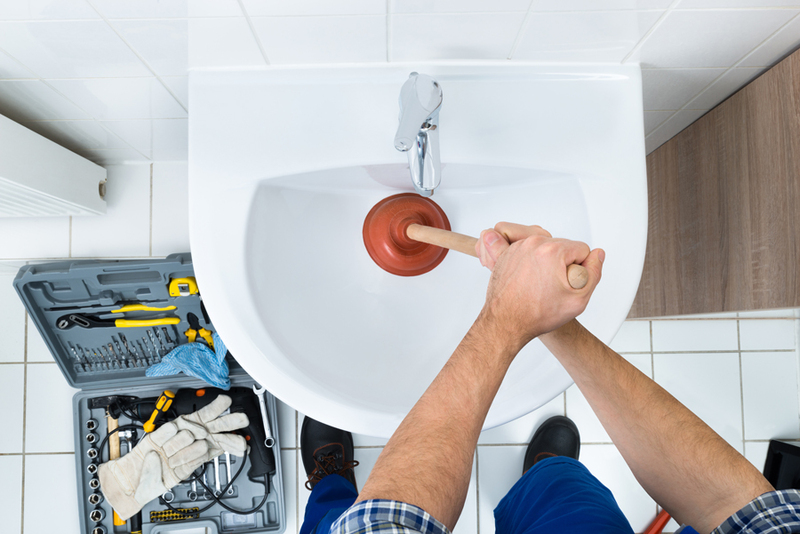 JJ’s Plumbing can also provide annual maintenance inspections to prevent large problems from occurring in the future. Load your dishwasher to capacity – do not do half loads! When entertaining family and friends, don’t let the extra food go down your drains and clog them. We are all looking forward to the summer, but it’s important to be responsible for your home’s plumbing system ever season of the year.